One of my favorite time-saving tips is to make a big batch of rice or quinoa at the beginning of the week. Then I use that as a base for a hoard of other dishes. 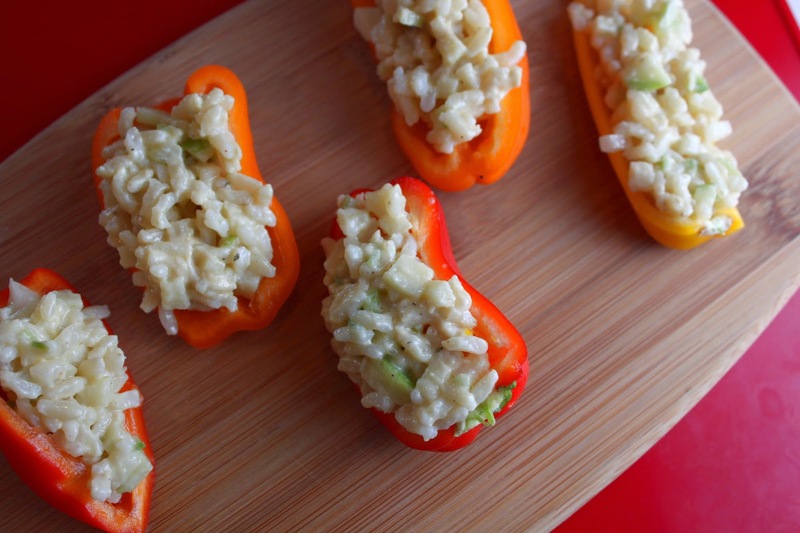 This week I had a bit of cooked brown rice on my hands, and I needed a super quick and simple appetizer to welcome a few guests into our home. Using what else I had available, this yummy little dish came together in a snap. It’s the green apple that really sets this apart. Tart, crisp and fresh. The hummus helps the rice stick together slightly and stay inside the pepper a bit better. For a warmer option, check out the Happy Healthy Tip below to turn this into a cheesy warm grilled version. Either way, it’s delicious! Toss together the rice, apple, onions, celery and jalapeno. Whisk together the lemon juice, olive oil and a pinch of salt and pepper and toss with the rice mixture. Set aside. Clean the mini peppers, and then cut in half and rinse out the seeds.